This morning the Census Bureau released the 2017 American Community Survey data. There is a ton to unpack here and even more once the microdata is released later this year. In the coming months our office will update and share some of this work. As expected, the latest Census data shows that Oregon’s economy continues to get better. Major economic markers like median household income and the poverty rate are showing ongoing improvements. That said, 2017’s gains are a bit slower than those seen in 2015 and 2016. This is in-line with what we’ve seen in the real-time data like withholdings out of Oregonian paychecks and the monthly job numbers. Oregon’s economic expansion is transitioning down from those peak growth rates a couple years ago to something more sustainable, and eventually something closer to growth in the working-age population. As such, Oregon’s gains in 2017 were essentially in-line with nationwide improvements instead of outpacing nearly all other states like we did a couple years ago. And as we will get to in a minute, there is one potentially worrisome sign that will require a big more digging to figure out what exactly is going on. 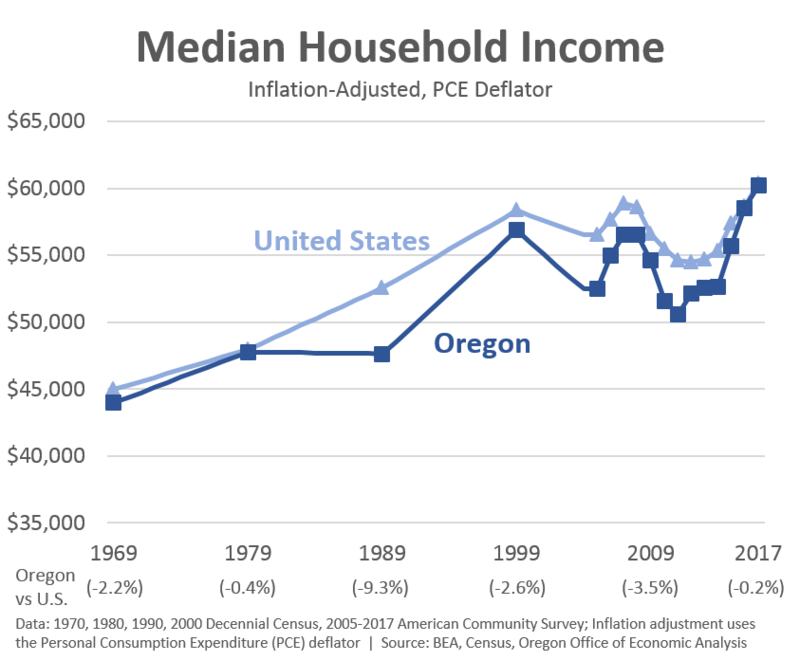 First, let’s take a look at historic trends in median household incomes here in Oregon and across the country. In terms of how the typical Oregon household stacks up to the U.S. this is our office’s preferred measure — not per capita personal income. The good news is that the improvements seen in the past few years are sizable. 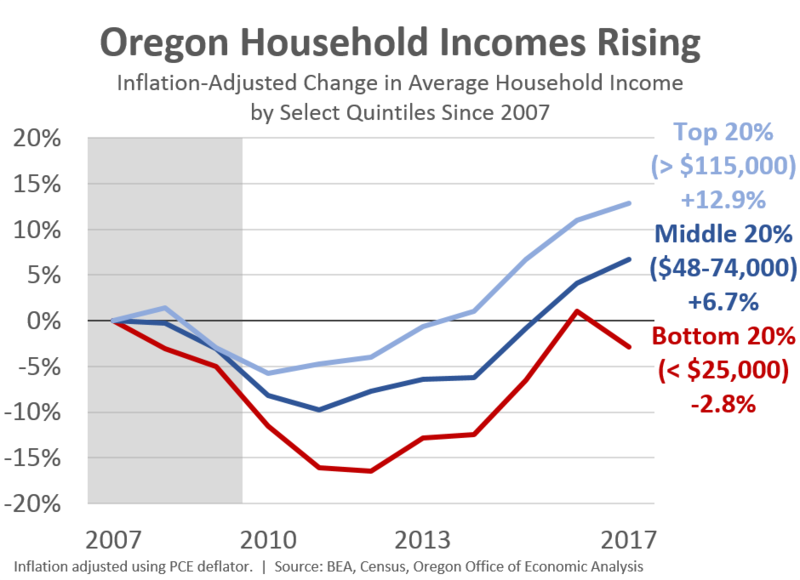 Oregonian incomes today are at their historic high — at least when using PCE as the deflator — and just like last year, they have essentially caught up to national incomes, which is something we haven’t seen since the mills closed in the 1980s. 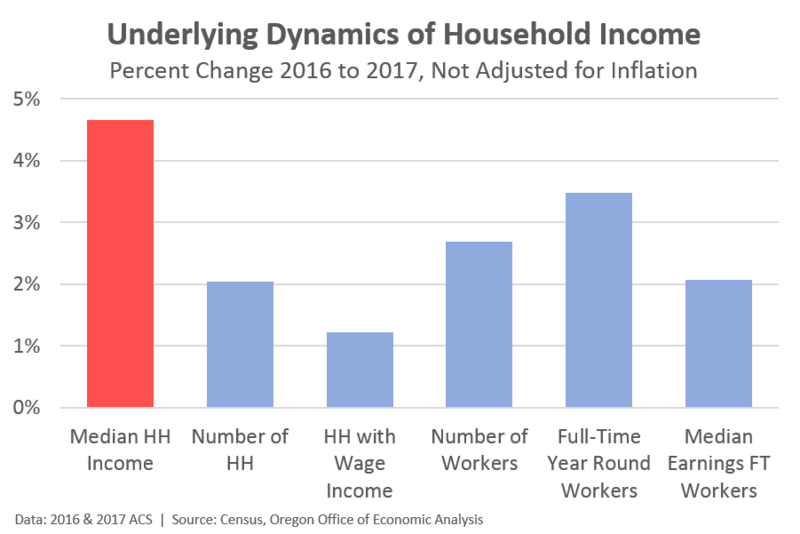 In looking at the major drivers of median household income in Oregon last year, they are a bit more of a mixed bag than a year ago. The good news is the economy continues to employ more Oregonians and more importantly, even more Oregonians on a full-time basis. This is the major driver of the household income gains. And this is exactly what we want to see. That said, earnings for full-time workers increased by about $1,000 which was just 2.1%. Overall, the nominal increase of 4.7% household income growth is solid, and in-line with the national increase. The one worrisome spot is that the bottom 20% of households did not see income gains last years. The top 80% of households did see gains and the improvements were strongest in Oregon for the second and third quintiles — those in the $25,000 to $74,000 range. However, incomes for the lowest quintile took a step back back in nominal and real terms. This feeds directly into the poverty rate numbers we will discuss in just a minute. But first, this decline in incomes for the lowest quintile is a surprise. This quintile had seen the strongest gains in recent years — driven by the labor market. The question is whether or not it is a real decline, or potentially just noise in the data. It is also possible that it is driven by stronger household formation, in addition to age-specific household formation, which would or could alter the overall distribution. For now that is my hunch, but I do not know for sure and we will need to wait for the microdata here in another month or so to dig into it. 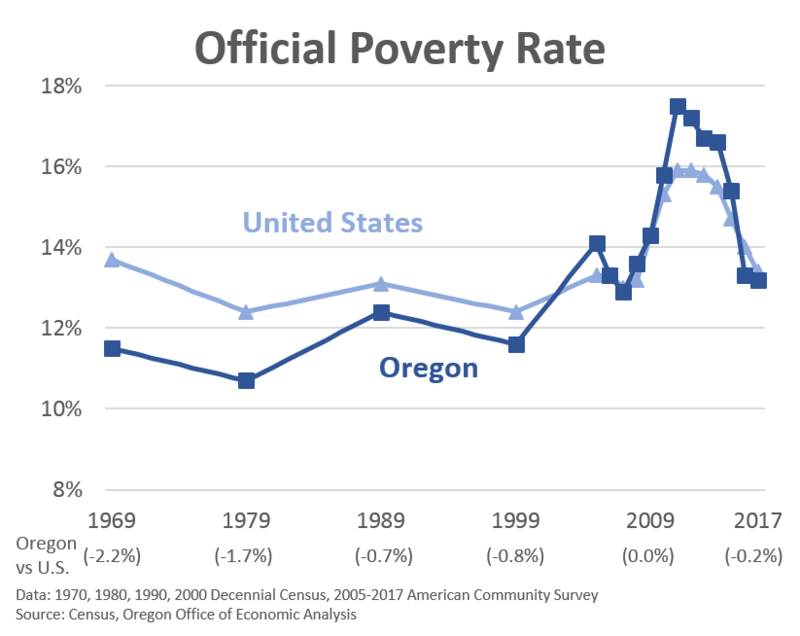 When we see that incomes for the lowest quintile of Oregonians did not improve, then it should come as no surprise that Oregon’s poverty rate did not improve significantly over the past year either. Now, the rate did tick down from 13.3% in 2016 to 13.2% in 2017 which is still progress, just maybe not as much as one would have expected given all the other available data. That said, this marks the lowest Oregon poverty rate since 2007 when it was 12.9%. The last time Oregon saw sustained rates this low was in the 1990s, although we have a ways to go to reach those figures. In decomposing the poverty rates just a little it shows a couple of things. First, we are seeing ongoing improvements in the poverty rate itself, but also for those in deep poverty (less than 50% of the poverty threshold) and those doing just a little bit better than the threshold. But we are seeing significant improvements among our communities of color, while poverty rate figures for whites held steady last year. 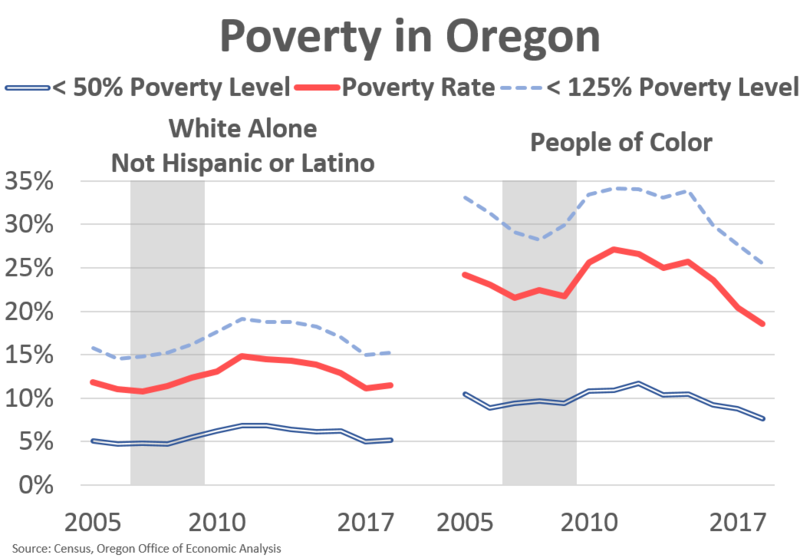 The biggest improvements, particularly among those in deep poverty were seen among Oregonians identifying as black or Hispanic or Latino. Now, poverty rates remain significantly higher for our communities of color than they do for whites, but for the first time this gap narrowed just a bit. Bottom Line: Oregon continues to be in the feel-good part of the business cycle. That said, as we return to roughly the same vantage point as prior to the Great Recession, progress moving forward may be harder to come by. The cyclical improvements are essentially complete — incomes back up, poverty rates back down, as is unemployment — so further progress will be about fundamental gains and improvements, not just about returning to the status quo, which for many Oregonians and Americans wasn’t that great even a decade ago. As I tend to say in presentations, in the big picture, Oregon is now doing better than during the housing boom, but we have further to go to reach the better days seen in the late 1970s and late 1990s. Coming up this afternoon will be a high level look at household income trends in Oregon’s metro areas. « PSA: New Census Data, Put Your Hands Up!